From a health perspective it may be good that green tea does not contain all-too much caffeine. From a fat loss perspective, it clearly lacks caffeine. When it comes to dietary supplements, people like to pay tons of money for unproven ingredients with funky names and dubious or non-existent safety profiles; agents that have been scientifically proven to work, are safe and cheap, on the other hand, are non-sellers or at least considered to be non-effective. Obviously, I cannot really explain why that is the case (I suspect it is because people effect drug-like effects without drug-like side-effects from supps and are thus always on the lookout for the "next big"... hoax), I can tell you, though, that a recent study that is going to be published in one of the upcoming issues of the Journal of Strength and Conditioning Research (Jo. 2015) shows that caffeine and green tea, two supplements that belong to the previously described category, are everything but useless. 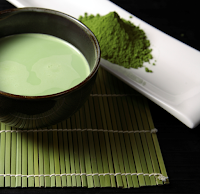 In said study, Edward Jo and colleagues investigated the effects of a caffeine + green tea polyphenol mix (250mg caffeine + 400mg of a green tea extract with 50% EGCG and 5mg of caffeine per serving) on (a) metabolic rate and fat oxidation at rest, as well as following a bout of sprint interval exercise (SIE) and (b) the performance during a standardized sprint-interval test. The study was a double-blind, randomized, placebo-controlled, crossover study that involvd 12 subjects (male: n=11; female:1 n=1) whose antroprometric data, i.e "body mass=76.1±2.2 kg; height= 169.8±1.6 cm; BMI= 22.7±3.0 kg/m2; body fat %= 21.6±2.0% [DXA data]" (Jo. 2015), already tell you that they were healthy recreationally active, but not necessarily athletic (it may be worth mentioning that they were relatively stim-naive with an intake of < 201mg of caffeine per day). 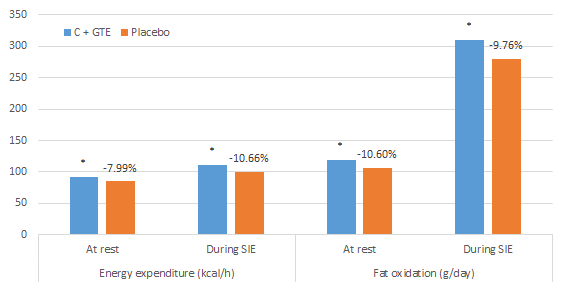 Figure 1: Energy expenditure (kcal/h) and fat oxidation (g/day) measure before (at rest) and during (during SIE) the sprint interval exercise 10 and 55 minutes after the ingestion of caffeine + GTE or placebo (Jo. 2015). During the two testing sessions at the Human Performance Research Laboratory of the California State Polytechnic University, the subjects' resting energy expenditure (REE) was measured for 45 minutes starting 10 minutes after the ingestion of the aforementioned caffeine + polyphenol mix - a mix that was consumed on an empty stomach after an 8-h overnight fast (don't be fooled by the way the scientists report their data in "g/day" and kcal/day - I changed the latter, already but the values for fat in g would have become to small - we are talking about 45 + 30 min and a 24h measurement here). Don't confuse increases in fat oxidation w/ fat loss: I guess we have to credit the supplement industry for propagating the myth that the ratio of fat to glucose you were burning was in anyway directly related to losing body fat. I am not sure how often I've written this on this blog or told someone in the gym: that is not the case. You can burn 20% more fat and still store more body fat if you increase your energy intake from exactly enough to already too much. The connection between fatty acid oxidation which would actually be a better term for the phenomenon we are talking about is complicated and a decreasing respiratory exchange ratio, i.e. a reduction of the ratio of glucose to fat that's used to fuel your metabolism is not a reliable predictor of fat loss. "Sprint-Interval Exercise Protocol. The SIE protocol was performed on the Velotron DynaFit Pro cycle ergometer and comprised of four 30-second maximal effort intervals each separated by 5 minutes of low-intensity, constant workload cycling (Figure 2). First, the ergometer was properly adjusted for the subject. Adjustment specifications for each subject was recorded during their familiarization visit and repeated for all experimental trials. Subjects initiated the SIE protocol with a 5-minute interval of low-intensity cycling at a constant workload of 75W. Immediately after, subjects cycled with maximal effort for 30 seconds against an added resistance that is 7.5% of BW for males and 7.2% for females. These two intervals were repeated three additional times. After the last 30-second sprint interval, the subjects performed an additional low-intensity 75W interval plus an extra 3 minutes of cool-down at a constant workload of 30W. The total duration of the SIE protocol was 30 minutes" (Jo. 2015). A workout that had little effect on the effect of the caffeine + green tea combo which did, as you can see, when you compare the "at rest" and "during SIE" values in Figure 1, increase the energy at rest and during sprint interval training to a similar extent. More specifically, the increase in energy expenditure and fat oxidation was - within the margin of inter-individual variability - in the range of +10% during both conditions. Figure 2: Illustration of the sprint interval exercise test performed 55 min after ingesting the supplement (Jo. 2015). In view of the fact that we may safely assume that this effect should last for at least 2-3h this can be a practically relevant effect if it is complemented by a reduced energy intake and a caloric deficit. If the latter is not present, even the extremest increases in fat oxidation and energy expenditure will fizzle out and be as irrelevant as the effect of the caffeine + green tea combination on exercise average and peak power (W) during the sprint training, Jo et al. observed in their study... and "Yes! ", that is disappointing, but in view of the low dose of caffeine and the non-existent effects of green tea on performance during a test like this not really surprising. Did you know this SuppVersity Calssic? 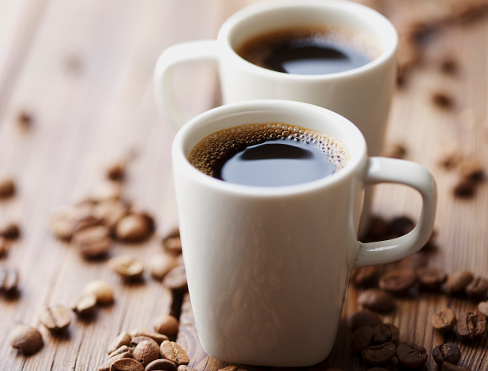 "Post-Workout Coffee Boosts Glycogen Repletion by Up to 30% and May Even Have Sign. Glucose Partitioning Effects | learn more! Bottom line: I admit, they certainly sound less exciting as the latest exotic herb from the rain-forest or a substance that is listed only under its funky chemical name on the label, but unlike your average "innovative breakthrough metabolic activator" caffeine and green tea will deliver. The 10% increase in metabolic rate and the accompanying increase in fat oxidation won't make you lose slabs of body fat, but the effects are pronounced enough to expect a measurable effect on the success of your next diet / cut. A cut, by the way, that will still require a significant reduction in energy intake, even if your energy expenditure and fat oxidation. So, don't be a fool and confuse a 10% increase in fat oxidation w/ a 10% increase in fat loss that occurs in the absence of dieting on an ad-libitum diet | Comment!